In my Technical Communications course at Rose-Hulman, I worked with a fantastic team of three other students to complete a research project intended to aid the efforts of our Engineers Without Borders club. Our specific project was meant to give Gomoa Gyaman--a small, Ghanaian, subsistence farming community--the ability to read at night, something they normally can only do by the sparse light of a kerosene lamp. After 10 weeks of extensive work, this is the solution we came up with. 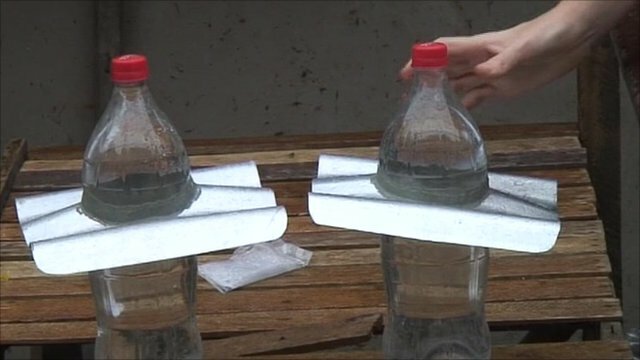 Traditional Moser bottles—invented by Brazilian mechanic Alfredo Moser—are clear plastic beverage bottles filled with water and bleach that can be fixed into the roof of an unlit building to refract sunlight around a room. According to the Liter of Light organization, this design has already lit thousands of homes across India, Indonesia, and the Philippines. Our team modified the design of the traditional Moser bottle to create what we affectionately refer to as the hybrid Moser bottle. A hybrid Moser bottle (HMB), like traditional Moser bottles, consists of a clear plastic bottle, some water, and a splash of bleach. HMB systems are also still illuminated by a light source shining through the bleach-water solution. However, unlike the typical Moser bottle, the hybrid Moser bottle is also equipped with a number of LEDs underneath the cap. Hybrid Moser bottles, as the name suggests, are powered by two different energy sources, sunlight and electricity. This allows users to light their home during the day with sunlight and during the night with electricity stored in a battery. The battery can be charged by any DC source, but our design centers around using a small, portable solar panel. Our team believes that this design has the potential to help developing communities all over the world just like the traditional Moser bottle has. If you like our idea, please share this instructable on your preferred social media site so that it may be seen by as many people as possible. If you don't like it, we would certainly appreciate your constructive criticism in the comments. If you have any questions, I will do my best to answer them. Thanks for taking the time to read my first contribution to the incredible community that is Instructables. Place the bottle cap on your scrap piece of wood. This is done to prevent hammering a nail into your (or worse, your parents') nice dining room table. If you're working on a surface you're not particularly protective of, feel free to skip the scrap wood. Punch holes into the bottle cap by hammering a 14 gauge nail through the cap in the desired places. Be sure that the holes form the radial pattern shown in the diagram. Helpful Hint: The leads of an LED can be used to help identify where the corresponding hole should be punched. Test fit the LEDS to be sure that they all fit nicely with no overlap. The LEDs should be able to be pushed all the way to the bottom of the cap. If your LEDS do not fit in the cap without overlap, you will need to either punch new holes or start over with a fresh cap. Apply a generous dab of silicone to the inside of the cap. Be sure that the silicone covers every hole in the cap. We are doing this to create a water tight seal so that no water can enter or exit the bottle. Insert the leads of the LEDs into the holes according to the diagram. Be sure that all of the longer (negative) leads are inserted into the holes closest to the center of the cap. The shorter (positive) leads should be inserted into the corresponding holes closer to the edges of the cap. Separate the long, inner leads from the short, outer leads by bending the edge leads away from the center of the cap as indicated by the picture. Twist all of the long, inner leads together. Also twist all of the short, outer leads together. Be sure that none of the outer leads are touching the inner leads and none of the inner leads are touching the outer leads. Contact between the two types of leads will cause the hybrid Moser bottle not to function properly. Remove the label from your clear plastic bottle. Fill the bottle to where the top of the label would normally be. Add a capful of bleach. The bleach will prevent the water from turning green from bacterial growth. Screw on the finished LED equipped cap. Be sure that the silicone has dried completely before screwing on the cap. The hybrid Moser bottle is now completed and ready to be mounted and wired. My team did not have access to a corrugated-roofed building in need of day and night time lighting. So unfortunately, I have no pictures of mounting hybrid Moser bottles. However, I was able to track down some photos online that I will use to explain the process. In this step, it will be necessary to cut corrugated sheet metal. There are numerous ways to do this, the simplest and cheapest probably being to use sheet metal shears or tin snips. Begin by cutting out a square of corrugated metal with sides measuring approximately three times the diameter of your bottle. In the center of your square, cut a hole the size of your Moser bottle. Your bottle will need to fit snuggly inside this hole. Insert your bottle into this hole so that the top third of the bottle is exposed above the metal. Seal the gap between the bottle and metal with silicone. It is crucial that this seal is watertight so that it does not leak when it rains. Now a hole must be cut into the roof of the building. The hole must be large enough that the Moser bottle easily fits through it and small enough that your metal square will sufficiently cover it. Apply a generous helping of silicone around the hole and cover it with the metal square and Moser bottle assembly. Be sure you are forming a watertight seal! Our design for the Ghanaian community of Gomoa Gyaman calls for a hybrid Moser bottle system that consists of a small 12V 1W solar panel, a 12V 7Ah lead-acid battery, six hybrid Moser bottles, one 8 ohm resistor, and an optional switch. This setup guarantees about three and a half hours of use for every 12 hours of charging, which is ideal for the Gomoa Gyaman community because they receive 12 hours of daylight. The system specifications can be modified to suit your needs. A higher wattage panel will charge your battery more quickly and a battery with a larger capacity will be able to stay charged longer. You could increase the number of hybrid Moser bottles as well, but this will drain power more quickly. We picked our specifications with Gomoa Gyaman in mind. We wanted them to be able to use their system every night for a reasonable period of time, but we also tried to minimize costs, because they are subsistence farming community with little money to spare. Six hybrid Moser bottles is enough to light a 500 square foot, one-room home that is typical in their community. If you intend to use our design, wire your hybrid Moser bottle system according to the diagram shown. This orientation guarantees that the LEDs are operating within their manufacturer specifications. For developing communities, we recommend twisting the leads together where connections are made. The connection can then be sealed by the addition of silicone. note: If you construct your HMB system without a switch, you simply need to connect and disconnect the leads from the battery manually. another note: The solar panel that we suggest is fully weatherproofed, but because it is so portable, we recommend taking it out in the morning and bringing it back in at night to extend its lifetime. i like this site want to download ?? The only thing I can criticize is the battery because along with handing them out in this device you would also need to deal with disposal. Developing a way to provide light at night without a toxic battery should be designed as to avoid the toxic mess heavy metals can cause. I agree, and so here are two suggestions: 1. power the light with a potato. After one night of power, the potato is eaten for breakfast the next morning so no waste and no toxic waste. 2. a. Power the light with a small water turbine from a bucket of water on an elevated stand draining into a bucket below. After the bucket is empty, someone fills the top bucket from the bottom bucket. This converts a short time of human effort into a long stream of light. 2 b. convert a wind-up music box into a wind-up generator. This also converts a small amount of time of human effort into a long time of of low voltage electricity to power a small LED. step 5: drawing says, "water and ammonia" ??? Good catch! This instructable borrowed some pictures from other sources, so although this instructable chose to use bleach, some other people may prefer ammonia. Please, no one mix the two. They will react forming a noxious gas that has potential for serious harm. The addition of bleach OR ammonia is only to prevent algae from growing and clouding the water. What about Mineral Oil? It doesn't heat up easly and is no conductive so you don't have to worry about shorts or contamination. i live in a 14 x 32 foot pocket home with a 7 foot ceiling. a few of these would be PERFECT! Interesting we both have explored ways to generate the electricity and it's exciting to see where this could go... Liter of Light are also are looking into LED incorporation of Moser Lights using PV Cells.